Hampton Regis is a small harbor town on the southern coast of England, a place with an ancient history but long since passed over by its larger neighbors. There, in the year after World War I has ended, a tragedy is in the making - a woman-s husband has been attacked and badly injured and the suspect, the man she loved before he left to go to war, has taken the wife and her maid as hostages. The desperate man, Stephen, threatens to kill the hostages unless the local police bring in a man he knew in the trenches - Scotland Yard Inspector Ian Rutledge. Rutledge, still struggling with his own demons from the war, fears that in stepping into the emotional struggle of these three people, he can-t be objective. Their situation in a sense mirrors his own. As a result of Rutledge going off to fight, he too lost the woman he loved to another man. If, as Stephen claims, he didn-t try to kill his lover-s husband, then who did? And what has happened in this little town that is worth killing for? 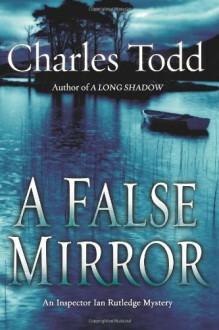 Once again, Charles Todd has placed the tormented, yet brilliant policeman into a situation that, while it brings back his haunted past, must be solved before a killer strikes again.